The French film Marguerite (Arts Fuse review) was a fictionalized account of the career of the famously bad opera singer Florence Foster Jenkins, who died in 1946. She became a cult figure with significant record sales, including a a best-selling recording of her one and only Carnegie Hall concert. The scathing critical response to that final performance may have accelerated her death from a heart attack, yet her recordings continue to sell with an fan base that included the late David Bowie. The story of this fabulous eccentric has now inspired a glossy Hollywood comedy. 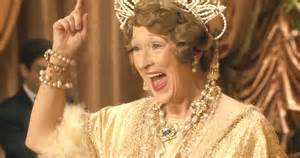 The genesis of Florence Foster Jenkins began with a script by Nicholas Martin, which brought director Stephen Frears on board, followed by Hugh Grant and, soon after, Meryl Streep. 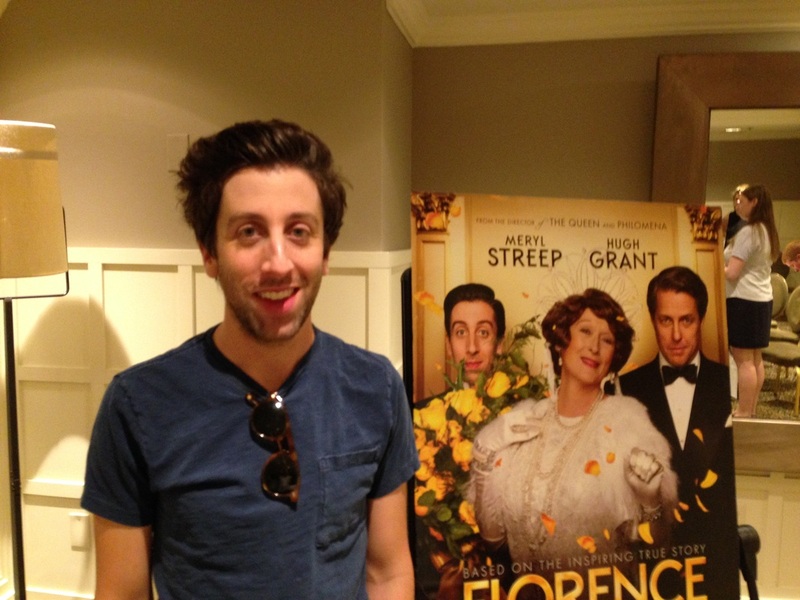 Also featured is Simon Helberg from CBS’s The Big Bang Theory, a skilled comedian and pianist. The tone of both the narrative and the performances are straightforward, aiming at comedy much more often than the French film. As he has demonstrated with Sammy and Rosie Get Laid (1987) through Dangerous Liaisons, The Grifters, High Fidelity, The Queenm and last year’s under-appreciated Philomena, Frears is a master at balancing comedy with fliers of emotional reality. The era of the 1940s are evoked with panache by the production team: cinematographer Danny Cohen (The Danish Girl), costume designer Consolata Boyle (Philomena) and set designer Alan MacDonald (The Queen, Philomena). At times the soundtrack by the prolific Alexandre Desplat sounds like a Nino Rota score for a Fellini film, adding just the right touch of whimsy to a film in which classical musical is the centerpiece. Hugh Grant is St Clair Bayfield, Jenkin’s manager and common-law husband, who doggedly stage manages the deception. He makes sure there is a tacit agreement among the audience members that Jenkins is never to be exposed to ridicule or made aware of her defect. Her wealth as a socialite allows the concerts to remain in-house and they become wildly popular. Bayfield, thirty-five years younger than Jenkins, devotes himself to her alleged career while keeping a lover. It is not clear if Jenkins regards him as a husband nor why Bayfield’s lover puts up with all of this playacting. Grant, adept at performances combining charm and mischief, makes Bayfield’s relationship sympathetic and somewhat understandable. Jenkins suffered for decades from syphilis passed to her by her first husband. She is unable to have children and has been crippled in one hand, which destroyed her career as a piano teacher. It is clear that Bayfield loves her for who she is: a lover of life and music, full of elegance, style, and money. Whether the latter combination serves as sufficient motivation for a lifetime of service is an open question. It is not a relationship that will be consummated. Perhaps the relationship with Jenkins keeps his business dreams alive and enables an elegant lifestyle. Bayfield, as we see in the film’s opening scene, is an actor of modest talent: “I’ve played Hamlet many times, not as yet in the principal role,” he tells his audience while performing his own one-man show of famous monologues. Helberg plays her accompanist, Cosmé McMoon. When the pianist sits for his audition, his delicate playing — in contrast to bombast of the previous candidate — brings tears to the Jenkins’ eyes. He is given the job immediately. The other candidates are abruptly dismissed. As the first rehearsal begins, McMoon plucks the keys waiting for The Voice. Jenkins sings. He freezes in disbelief, but no one is laughing. Helberg, with his goofy comedian’s face, underplays this scene nicely. (It is also refreshing that the actor plays his own piano parts.) McMoon quickly recognizes the game being played and, despite deep reservations, he goes along with the ruse. Yes, there is money involved, but the gentle McMoon,has his own issues as a closeted gay man, insecure that he has what it takes to be a successful concert pianist. This is a job, after all, and he will be well paid. McMoon falls for Jenkins because of her passion and knowledge of music. Like Jenkins’ friends, who regularly attend her parlor concerts, we too come to care for the performer. Her admirable commitment and dedication to music cannot hide a deeper sadness in her soul: ill health, a scoundrel of a first husband, an unfulfilled love with St Clair Bayfield, and an obsession with the delusion that she is a real singer. Meryl Streep is a master at taking on characters that call for layers of emotional nuance as well as a veneer of eccentricity (think of her turns as Margaret Thatcher and Julia Child). She has also decided to take on variety of different singing roles recently: springing into the camp fun of Mama Mia, taking on Sondheim as the Witch in Into the Woods, and falling short as a rock singer in Ricki and the Flash. I recall her on Broadway in the Elizabeth Swados’ musical Alice at the Palace in the early ’80s. In this film, Streep was called on to learn all the scores and then hit notes with stunning and ear-splitting inaccuracy. The performances given by the best French actors (including the brilliant Catherine Frot as Marguerite) are usually delicate. Gestures and glances reveal much. Streep’s acting is of a different sort: meticulously crafted, muscular, and commanding. Her approach works for this portrait because, for Jenkins, life had became a stage. She imagines herself (in her own mind) to be a fabulous singer — not out of ego, but because of her worship of beautiful music and adoration of the classics. Almost no one in the select audience has the nerve or the heart to speak the truth. But, at one concert, Agnes Stark, a patron’s brassy girlfriend, explodes into hysterics. She is quietly led from the room and sinks to her knees in uncontrollable laughter. It’s a big comic moment for actress Nina Arianda (brilliant in the 2015 Broadway production of Sam Shepard’s Fool For Love). Yet Agnes will come to be touched by Jenkins’ quiet humility and courage.